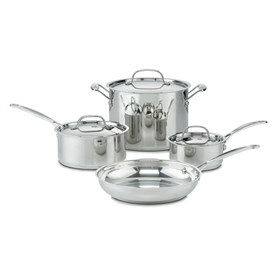 The Cuisinart 77-7 chef's classic 7 pc. set is classic stainless cookware collection inspired by the kitchens of France and the chefs that train and work in them. The set features 18/10 stainless steel and pure aluminum encapsulated in the base for fast and even heating. 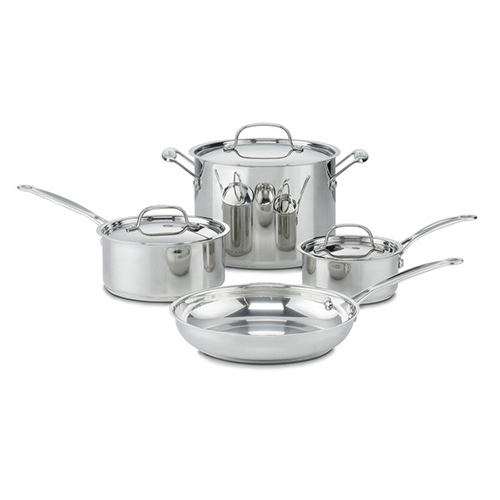 The pans are unsurpassed at distributing heat quickly and spreading it evenly with no hot spots. The 77-7 features Quantanium and nonstick cooking surface reinforced with titanium provides for lasting food release and is perfect for lowfat diets. All the lids are made of break-resistant glass and handles are pure stainless steel riveted for strength. Every piece in the set is oven-safe to 500 degrees. The Cusinart 77-7 has many exciting features for users of all types. You can extend the lifetime of your Cusinart 77-7 with the purchase of a FactoryOutletStore Factory Protection Plan. See the Cusinart 77-7 gallery images above for more product views. The Cusinart 77-7 is sold as a Brand New Unopened Item.